“The key is not the ‘will to win’—everybody has that. It is the will to prepare to win that is important.” This quote comes from legendary college basketball coach Bob Knight. Over the course of a career largely with Indiana and Texas Tech, Knight amassed 902 victories and proved to be a unique breed in coaching circles. However, I believe it is this quote from Knight that shows preparation is just as vital as the actual game. This is a factor that separates the good from the great. Everyone goes to practice. Even on bad teams, the players are still going to show up for practices. Otherwise, they wouldn’t even be on the squad. With this said, the difference between success and failure is how you practice, not if you practice. It’s easy to show up and just go through the motions. After all, what does it really matter if you out hustle others in practice, but still struggle in games. The only answer I have to these skeptics: what does it hurt to practice at game speed. This is the only way to enhance your game and translate this playing style directly to a game. In addition to this, it’s a way to impress the coaches. If you’re at the junior high or high school level, you may be wanting to gain some more minutes. What better way to do this than at practice where the coaches are carefully watching you? Likewise, if you’re at the youth level and are tired of being stuck at forward when you want to play guard, then make the coaches change their thinking. Prove to them that you can! When I ran cross country, my coach would always stress eating healthy. 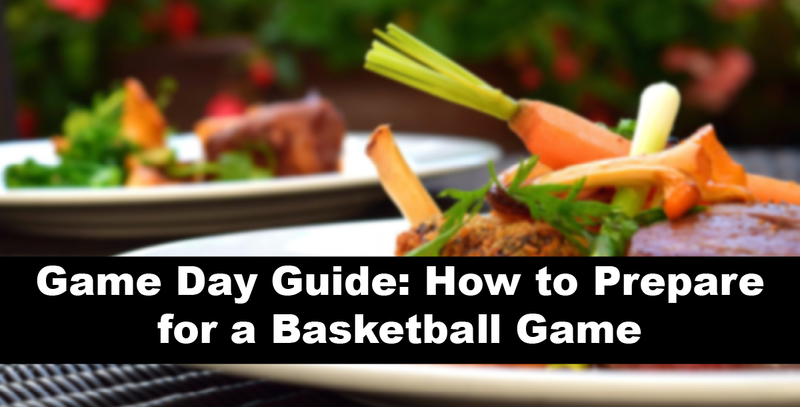 If you want to compete to the fullest of your abilities, then you must avoid falling victim to a poor pre-game meal. Even though cross country is a much different sport than basketball, the same logic holds true. As you lead up to the game (and really every day during the week), I recommend making sure you drink plenty of water and eat a meal that contains a significant amount of carbohydrates. For an example of this, I recommend spaghetti. I always have and continue to use this as a go-to meal leading up to any races I run. Just as eating right is important before your basketball game, it is also vital to get plenty of rest. I understand you might be nervous the night before, particularly if it is a big game or even your first game, but try to get at least eight hours of sleep. This is needed to compete at peak condition. If you’re constantly thinking you’re going to fail, then chances are you’ll fail. However, if you picture yourself in your mind succeeding on the court, then your odds of success rise. In basketball, it is important to see the ball going through the net. Even if you’ve had a few rough games, start believing you can succeed. This idea of mental picturing can be useful in any sport, not just basketball. On the night before your game, don’t spend tons of time stewing over the game. It is fine to do a little mental picturing, as discussed above, but don’t overdo it. Try to find something to keep your mind off basketball. Whether it be watching a movie or reading a book, you don’t want to get to the point where you’re thinking on the court the next day, rather than just playing. As I started to elude to in the prior sections, you’re going to have some failures in basketball. No one is expecting you to make 100% of your shots. In fact, making just half of them is a pretty solid percentage. With this being the case, don’t let one bad game hinder future games. Chances are you’ll have plenty where you can’t find your shot. That doesn’t mean you should let it affect everything else you do on the court. Build a short memory and have confidence in your game! The final item I will discuss focuses solely on the events right before the game. All of the stuff above broke down what to do in the days leading up. Once you arrive at the court, I recommend getting a solid stretching session in. This not only prepares you to compete at a high level, but it also ensures injuries won’t be an issue. Some coaches like to have their teams stretch together. The main thing is that you don’t ignore this part and get your muscles loosened up for game action. Next, you’ll need to go through shoot around. Most of the time, this will open up with lay-up lines before breaking individuals up to work on shots around the court. The key here is to take advantage of this time. Utilize it to work on shots you’ll shoot in game or ones that you’ve been struggling with. If free throws have been an issue, then take some reps there to build up your confidence. Similarly, if you’re shot from the corner has been off, then shoot some jump shots from there. The key is to see the ball go throw the net and build confidence leading up to game. In this course from CoachTube, Bill Thom provides some useful drills that can be completed during shoot around to work on various skills, including rebounding and rhythm shooting. Check it out if you’re struggling to come up with ideas! Odds are that you won’t find the perfect pre-game preparation routine after one time. It may take some tinkering before you fully understand how your body reacts to different things. With this said, as long as you’re working on doing everything right, there is little room for argument. It is when players begin to think they can do whatever the night before the game and still succeed on the court that troubles start to arise. Don’t fall victim to this illogical thinking.